(Newser) – Not since 1948—and not again till Nov. 25, 2034—has there been such a celestial happening, and it's one that ScienceAlert says is the "one astronomical event" you have to see this year. 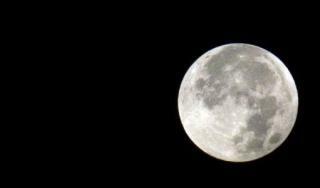 It's kind of a super supermoon, and many can first catch it Sunday night. As CNN explains, a "supermoon" occurs when the full moon coincides with its perigee (when it swings closest to Earth during its orbit), lending the moon up to 30% more brightness and the appearance of being up to 14% bigger. But on Nov. 14, the moon will boast even more superb timing and attain ultimate fullness within two hours or so of perigee—what NASA dubs an "extra-super moon." I just went outside to look at it. Other than being nice and bright, I saw no difference from any full moon. In fact, it looked pretty small??? Hmm take my wife out to see it she loves all that romantic stuff and I will get the reward later on.